As detailed in the February 2018 BBB study, romance scammers typically contact their victims through dating websites, apps or social media, often using fake profiles and even stolen credit card information. Using these false identities, scammers may spend months grooming their victims, building what is believed to be a loving relationship, before asking for money to handle an emergency or travel expenses. Money mules act as financial middlemen in a variety of scams. Victims unknowingly launder money from other victims by receiving stolen money or goods and sending them on to fraudsters who are often out of the country. This occurs when the romance scam victim has no money or has already given all of their money to the scammer. The victim may be a willing accomplice or may have a variety of other motives such as love, fear, or financial compensation. By providing this type of aid to the fraudster the victim implicates themselves to a variety of other frauds, making it harder for law enforcement to identify the real perpetrator. As law enforcement cracks down on romance scams and other frauds, money mules have also been prosecuted, sometimes facing jail time and hundreds of thousands of dollars in fines and restitution payments. In most cases, however, there is no desire to take criminal action against unwitting participants who had no financial gain and who stop transferring money for crooks as soon as they realize the role they have been playing. According to the new BBB report, cybersecurity experts have traced the bulk of online romance scams to Nigerians who operate these frauds in several countries around the world, including the U.S. The same groups involved in romance scams frequently operate other frauds on a worldwide scale. 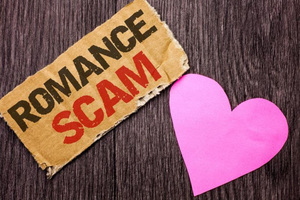 Five people have reported a romance scam in Connecticut last year according to BBB Scam Tracker. One expert reports that at any given time, there may be more than 25,000 scammers online with victims. Victims who have sent money through Western Union should contact them directly at 1-800-448-1492. Victims who have sent money through MoneyGram should notify them directly at 1-800-926-9400.